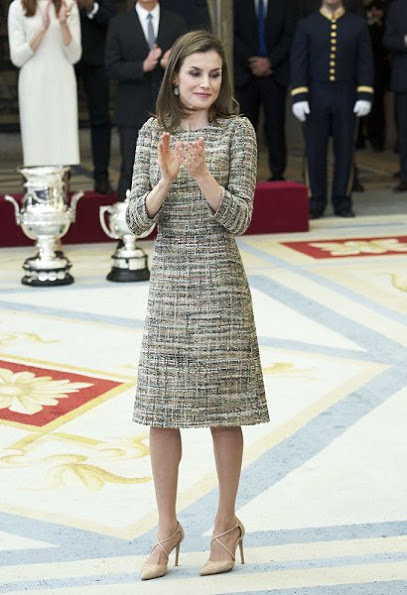 Queen Letizia looks great in that simple dress in nice fabric. Both queens lovely and elegant, Felipe handsome, JC a grumpy old man. Usted se equivoca. Todo el mundo que ha conocido a Don JC sabe que es muy alegre y simpático... excepto con Letizia. Porque no la quería para esposa de su hijo, evidentemente. Ha hecho lo posible para arruinar su matrimonio, pero no lo ha conseguido. Ellos se aman y han sabido resistir y formar una familia maravillosa. Love conquers all , no matter what. I agree completely. Such a simple dress which fits her perfectly! 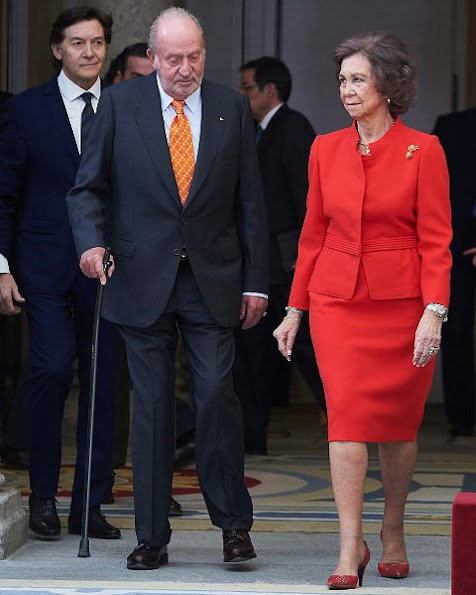 i have to comment on one more thing.... King Felipe looks so handsome!!! Un placer ver reunidos a 5 miembros de la familia. Una lástima que lo hayan puesto en horario escolar, porque Leonor y Sofía hubieran disfrutado mucho con los deportistas. Grandes Javi Fernández, Ruth Beitia, Garbiñe, Iniesta y los chicos de Baloncesto. 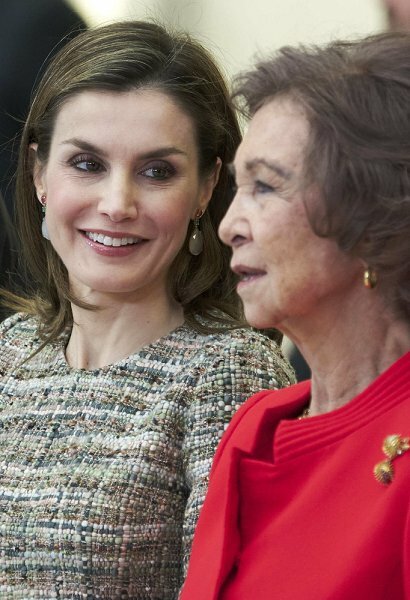 Beautiful Letizia looks great as always. 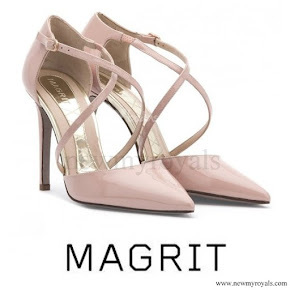 But why are they all so "official"? The event is about sports! Everyone is well dressed and I'm especially happy to see SM Juan Carlos and Doña Pilar. What the hell is with Letizia, why does she has to stand a bit with her side to the camera on group photos? Like, ALWAYS??? What is she trying to show/reach/demonstrate/state with this pose? ¿De qué habla? 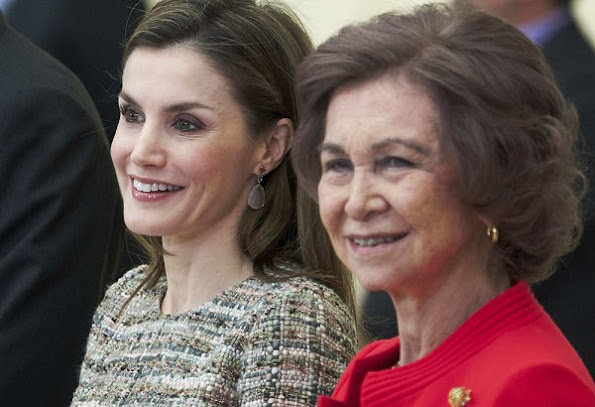 La actitud de Letizia es impecable, sonriente y amable. Hágase usted mirar su inquina hacia la Reina de España, no es bueno para su salud, tómese una tila. Looks to me like she was kind squished between them ZL. She usually poses straight forward. I don't think she is "posing". Pretty tight in the lineup right there. ZL, I have made the exact same comment about Letizia posing like that in group photos. She did the exact same thing a while back when she wore that weird dress with the cut out elbows. It's a pose you see lots of models and celebrities doing on the red carpet. In a group photo it's an easier way to draw more attention to yourself because you're the only one who's not directly facing the camera. Another way Letizia is trying to be the "trendy celebrity queen". Really? I need to go look at some pictures. I guess I am not looking at the poses much. This is a bit unfair. On another site I saw a different version of this lineup photo where Letizia IS facing forward! Diane, here's the picture where she's "sideways posing". She's not squished between two people, she had plenty of space to face forward but didn't. I've noticed that at least 7/10 group photos she's always the one turned to the side. It really makes no sense. Heather - Can you explain why you think it's unfair? She does it in the majority of group photos for some reason. 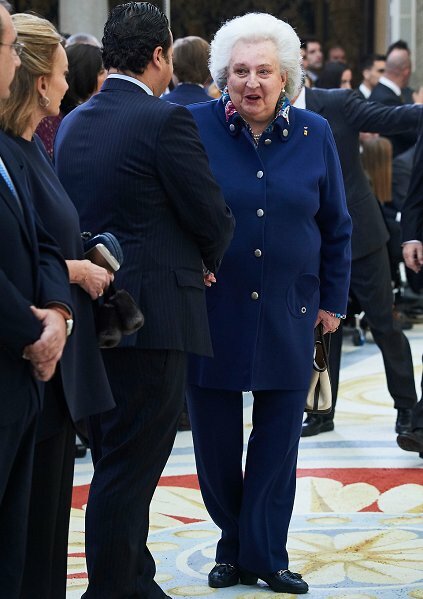 I haven't seen the other picture of her facing forward, but I do know that she does do her sisideways pose fairly often enough that people have started to notice it. I don't know of every other instance where she poses sideways but in this particular case I had already seen the photo where she did not, so I felt it safe to assume that she wasn't doing it deliberately - otherwise she would try to be consistent, no? Que cara mas dura la de JC, y Sofia tragando. Si yo fuera Leti tampoco me importaria que JC fuera antipatico. Bravo x F que si es un Señor. Vivan nuestros Reyes y viva la Reina Sofia! Does it really matter so much to some of you here how she is standing ? Kristina ¿no se ha dado cuenta de los intentos patéticos de algunas de buscar la mínima excusa para desprestigiar a Letizia? ¡¡Ponerse de lado o de frente en una foto. Enorme motivo de crítica!! Me darían risa si no me dieran pena. Angie, of course I do agree with you. I can not understand why some of the people are so concern about that.